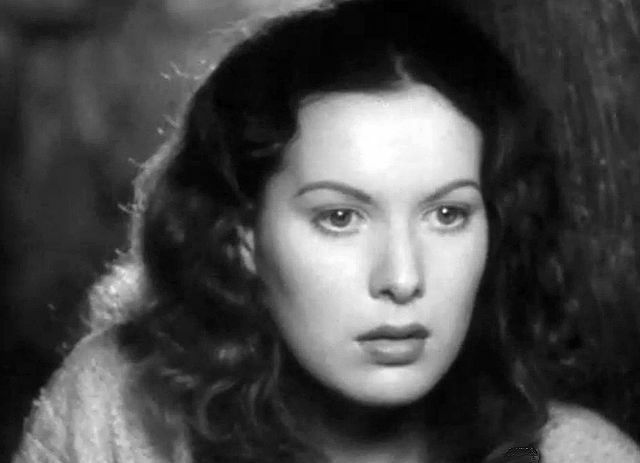 This blog post was in the works for me for a while but it’s ironic that I ended up writing it so near after the death of the amazing Irish actress Maureen O’Hara. The Hunchback Of Notre Dame was only O’Hara’s forth film coming on the heels of another one of her admirable performances, Jamaica Inn, released the same year and also staring Charles Laughton. I’ll admit that I had been avoiding Hunchback mainly because it takes place in the Middle Ages, an era that is difficult for me to relate to. But when TCM showed it as part of their Halloween horror fest in October, I couldn’t resist taking a look. The film brings the issues of desire and religion and justice to a relatable level for modern audiences and both Laughton and O’Hara are excellent as usual. But what really interested me about the film was the character of Esmeralda (played by O’Hara) who essentially becomes the prisoner of every man she comes into contact with. The story of the film is a classic. In 15th Century France, where the monarchy rules the peasant class with an iron hand (this was several centuries before the French Revolution) and “undesirables” such as heretics, gypsies, and physically or mentally disabled people. 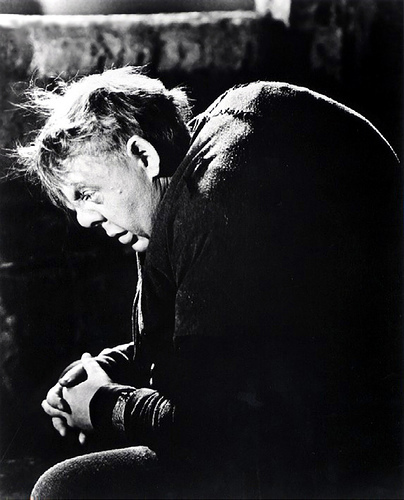 Esmeralda and the Hunchback Quasimodo (played by Laughton) fall into this category. Esmeralda is a gypsy who is being persecuted by Chief Justice Frollo (Cedric Hardwicke) because of the sexual desire she provokes in him. Several men try to save her throughout the film but it is only Quasimodo that succeeds in the end. The stunningly beautiful Maureen O’Hara, whom we lost on October 24, 2015 at the age of 95. It is no surprise that the men throughout the film only want to own the beautiful Esmeralda, with her warm sensuality and kind heart. The first of these is Frollo. When she enters the church, he immediately feels desire for her and tries to get her to stay but she runs away. Frollo, who has been Quasimodo’s caretaker since he was a child, sends him out after her but later denies that he was responsible for Quasimodo’s attempt to kidnap her. The one who saves Esmeralda here is Phoebus (Alan Marshal), the Captain Of The Guards and she immediately falls in love with him, thinking him brave and kind. But before she can declare her love for Phoebus, the beggars enter the scene. Caught in the web of street beggars of the Paris underworld, Esmeralda becomes the possession of a poet Gringoire (Edmond O’Brien) in the literal sense. Gringoire, being held prisoner by the beggars as an intruder and sentenced to hang by them, is given one more chance to live by Clopin (Thomas Mitchell), King Of The Beggars – if any of the young women in the clan consent to marry him, he will be saved. The only one to come forward is the compassionate Esmeralda. However, Esmeralda makes no secret of the fact that she is not in love with Gringoire but with Phoebus, who turns out to be just like Frollo, although less twisted and more overt with his desires. During a night of festivities for King Louis XI (played by Harry Davenport), the nobles have a party and Esmeralda gets locked into a compromising position with Phoebus, though he is killed before the seduction can occur. Unfortunately, it’s Esmeralda who is accused and convicted of the murder. But just as she is about to hang, Quasimodo sweeps down from his place on the Notre Dame Cathedral bell tower and puts her out of harm’s way. Gaining access to her is difficult, as the Church was a sanctuary that the monarchy could not touch at that time. However, even though Esmeralda is safe, she is not free but kept captive in the bell tower by Quasimodo. Although Esmeralda is exonerated from the crime in the end and restored to the Paris streets, she ends up with Gringoire, whom she realizes she has loved all along. 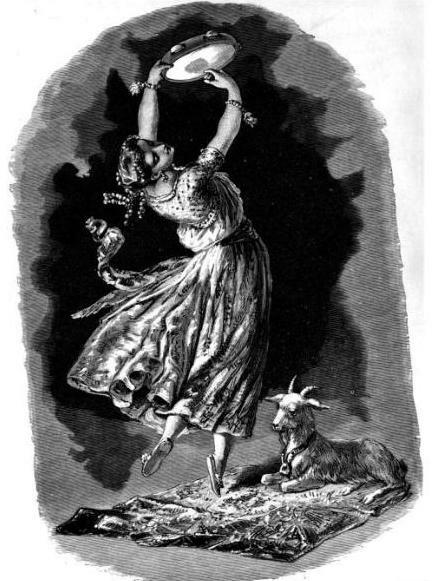 It is perhaps no surprise that Esmeralda, a woman alone with no family, would not exactly be the mirror of feminine independence int he 15th century but it is significant that the beautiful and sensual gypsy woman is handed down from man to man in the film don’t just want to help her but want to possess her, whether through sexual conquest or desire or marriage or heroism.